Lynne Greene (center), wife of City Clerk Rodney Greene, sits before Evanston's electoral board, along with clerk candidate Devon Reid (right). Greene filed a challenge against Reid's candidacy, but the board decided on Monday morning that he could stay on the ballot. 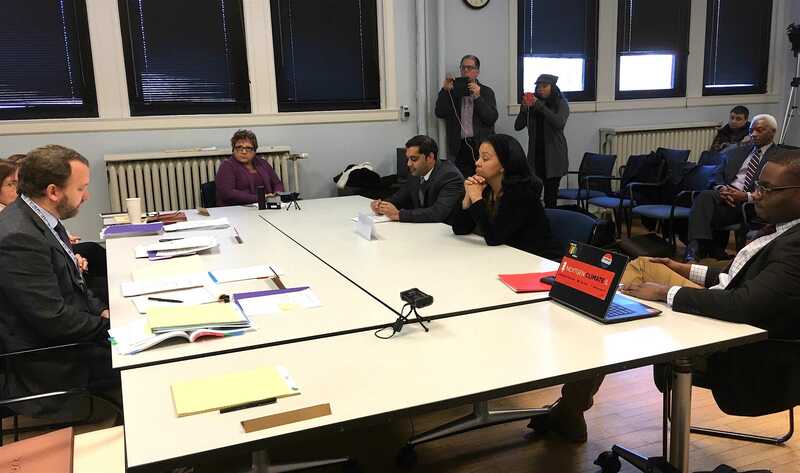 City officials dismissed challenges to three mayoral and clerk candidates at a hearing Monday, allowing them to appear on the ballot. In an election that has become unusually tense months before votes are set to be cast, Monday’s hearing picked up with a final statement from a lawyer of one of the challengers. The board’s final decision was postponed on Friday when City Clerk Rodney Greene, an electoral board member, suddenly fell ill and was taken to the hospital. Scott Erdman, counsel to Evanston resident William Arndt, who challenged the mayoral bids of businessman Steve Hagerty and former Evanston Township supervisor Gary Gaspard, aimed to persuade the board to disqualify the candidates from the race. Arndt, a contributor to mayoral candidate Ald. Brian Miller’s (9th) campaign, challenged Gaspard, Hagerty and candidate Ald. Mark Tendam (6th) earlier this month on the basis that the candidates indicated the wrong election date on their petitions. The crux of Arndt’s argument rested on a 1992 citywide referendum, which called for a mayoral primary if more than two candidates enter the race. Gaspard and Hagerty had not included a February primary date on their petitions, just the date for the consolidated election in April. Arndt withdrew his challenge to Tendam on Friday before the meeting was postponed because his nominating papers had specified the primary date. “The very thing I was accused of not doing was done correctly, even by their standards,” Tendam told The Daily. The board determined Friday that it would not consider evidence relating to the referendum, partly because Arndt had not submitted the information in a timely manner. Erdman urged the board to not ignore the “will of the voters” in originally voting for the primary in the ‘90s. Tendam told The Daily he believed Arndt was working with Miller to find reasons to file against the three mayoral candidates. Miller was not present at Monday’s hearing and has not replied to multiple requests for comment. He released a statement on Sunday confirming that one of his supporters filed challenges to the three petitions. In the statement, Miller said it is city officials’ duty to “abide by the will of the voters” in holding a mayoral primary. Miller also said he consulted election law experts about the referendum and then city officials. Miller did not respond to a question over email as to why he stated he himself had filed the challenge, rather than his supporter. Without Greene, who was absent from the meeting, the truncated electoral board of Mayor Elizabeth Tisdahl and Ald. Ann Rainey (8th) overrode the challenge to both candidates’ bids, 2-0. Also dismissed Monday was the challenge lodged by Lynne Greene, the wife of Clerk Greene, against his opponent Devon Reid. Rodney Greene had recused himself from hearings on the city clerk election, with Ald. Melissa Wynne (3rd) filling in for him. However, Wynne was not present for Monday’s hearing because she was on vacation. “You’re making this up,” Rainey said, ultimately declining Reid’s request. Lynne Greene challenged Reid’s city clerk bid on the grounds that Reid did not file a statement of economic interest — a required component for registering in municipal elections — within the prescribed window of Nov. 21 to Nov. 28. On several occasions, Reid argued, Clerk Greene misidentified the filing window as Dec. 12 to Dec. 19. The city clerk’s webpage says the office will accept petitions for all races until Dec. 19. Reid said he filed his statement of economic interest on Dec. 7. Reid also raised concerns about the circumstances surrounding the filing of Lynne Greene’s complaint. She officially challenged Reid’s candidacy on the evening of Dec. 4, a Sunday, during which time the clerk’s office would have been closed. Clerk Greene did not respond to a request for comment. Tisdahl said the decision about Reid’s candidacy was “very tough” for her personally.